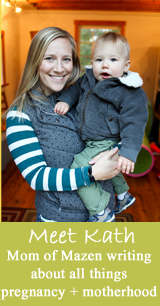 KERF reader Stephanie emailed me last week and asked if we intended to use cloth diapers. YES we’d like to try! As it turns out, she had about 45 (FORTY-FIVE!) cloth diapers of all different brands that she no longer needed and shipped me a HUGE box of them! Liners too! I’m so thankful to be able to try a variety of brands (and hopefully like them all) with such a great cost savings by reusing them. I’d love any feedback you guys have on these brands! I thought I would know what to do with them when I opened the box, but as I picked them up one by one to show Karen how they worked, I realized I didn’t have a clue! Inserts here and there, snaps and Velcro in funny places. I’m sure I’ll figure it out with some research – I still have lots of time!! And Cville actually has a cloth diaper club that I learned about about the Birth Expo – they said they would teach me everything I needed to know. I also hope to read up on cloth diaper blog posts like these from Emily and Sherry. Oh and one more detail….I hope I’m having a girl just because I bet a boy wouldn’t be wild about zebra stripes. I don’t know if I could do cloth diapers. Are you planning on having a separate washer for them? I just can’t get past putting poopy liners into the same washer that I put my clothes through!! Well you have to wash the baby’s poopy clothing too. Breastmilk poop is water soluble, and once it is solid poop you just plop it in the toilet first and then wash them. Seriously? 45 diapers? That is a huge gift. I am going to be cloth diapering as well. I plan on buying my diapers in the next two weeks. 45 is a huge gift! We’ve been cloth diapering with 24 for the past 7 months, and that has been plenty. (We wash them often, but it’s been plenty!) I’ve been considering picking up 4 or 5 more over the next year or two so that we have 30 stashed away for future babies. But 45 is great! How awesome! I used Bum Genius with my 3rd baby (1st two used disposables) for a while but I found they leaked and were SO bulky. I probably should have tried out more brands but with working and having three little ones I just threw in the towel with that. I do use cloth wipes though and keep them rolled in a wipes warmer with water, tee tree oil, lavender, and jojoba oil. So that is my contribution to the earth for now, at least our wipes are cloth :-). I think you will have better success than me since you have all these brands to sample and see what works best! My sister-in-law and brother exclusively cloth diaper their baby who is now 15 months and they love it. Isn’t in fun to have all this tangible stuff like diapers around? I loved that while pregnant, so exciting and makes baby’s arrival seem so much more real! We use cloth diapers & love them! We started with prefolds because he was so tiny but he finally fits in the all in ones- love them sooo much. Right now my favorites are the Fuzzi Bunz Elite because they adjust down really small and the inserts are beyond super soft. We’ve used three of the brands up there… Bum genius, Blu berry and Bummies, I used them through two kiddos. Fuzzi Bunz were probably my favorite. (Another fleece lined pocket diaper with inserts.) You’ll come to find that you’ll like different diapers better for different circumstances… some are better for over nights (i.e., those hemp inserts with the green stitching [top, left] are really absorbent, especially with a microfiber insert), some are really bulky and fit better under different outfits, some are good for when you’re just hanging around the house and can easily change diapers frequently. 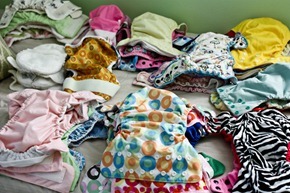 Cloth diapering gets to be sort of addictive with all the fun and cute things there are to buy. And you can almost always resell them when you’re done with them, even if you got them second hand! I have a 22 month old that I still use cloth diapers with although he’s started potty training. We bought a few different brands: g, kushies and thirsties. The thirsties covers and g inserts worked best for us because the other brands didn’t fit his body that well. They are adjustable, but babies come in all different shapes and sizes so its great you get to try a ton out to see what works best. Also, don’t be worried about poo. You can get the spray toilet attachment or biodegradable liners and there will be very little to no poo in your laundry. And urine is sterile, so that’s no problem. They’ve been great for us and saved a ton of money so I hope they work well for you. And if not there are better disposable choices these days as well. That zebra one is too presh! Cloth diapers kinda freak me out, I can’t lie. How do you wash them? Do you scrub them by hand? Throw everything and its… contents… into the wash?? So many questions! Solid waste is knocked into the toilet, along with the paper liners if you use them. Simple. And when babies are 100% breastfed, their poop is basically liquid, you can just toss the dirty diapers in the wash as is. Cloth diapers really aren’t gross or complicated at all, and they’re so much nicer for baby’s skin. Kath, I can’t believe you were sent 45 diapers! That is hundreds and hundreds of dollars worth. That’s like a thousand dollars worth of diapers!!!! Most of those diapers are at least $20 each plus the liners are give or take $8 each. And when I CD’ed (for about 2 years) I ALWAYS had to put two liners in each diaper to avoid soaking thru. Before I read food blogs, I read diaperswappers.com and was seriously in love with CD’s. The prints, styles, cuts, brands…so many to choose from and just about the time you think you’ve found your perfect diaper, your baby grows. Or their thighs get smaller but their waist gets bigger and what used to work, now gaps, sags, leaks, etc…so it’s a constant search. But I loved it. My day-in, day-out, workhorse diapers were Bum Genius 3.0’s (not ALL in ONEs, those never get stink free in the wash for me) but 3.0’s plus TWO microfleece liners. And not hemp, not cotton, microfleece. I know this might be a silly question, but will us readers ever be caught up with the week of your pregnancy you are actually on? I feel like it’s a bit of an overkill with all these posts for just week 12 and apparently, you will be doing this as well for the weeks to follow. I just don’t understand why such a delay? You already have an amazing amount of people reading your blog, do you really need to try and lure more people in by stretching out your posts? These are the posts I’ve written, and I told myself I’d post 1-2 a day so I wouldn’t get overwhelmed. I imagine I’ll catch up to read time by the end of next week, but I will still be posting every or every other day. HOLY COW! That is a huge gift. Cloth diapers are really expensive. You’re lucky! I’m jealous! We are building up our stash slowly but surely. I’m buying a little bit every few weeks. A random person gave you at least $700 worth of diapers? The mind, it boggles! I’ve bought a few diapers so far- BG, fuzzibuns, blueberry and AMPs. Hope they work out! Well, in the spirit of Stephanie’s generosity, if you don’t have a girl I’m sure you can find someone else in need of diapers…maybe even someone who can’t actually afford them…and you can donate them. I absolutely will. And I’ll pay it forward when I’m finished with them all. My mom used cloth diapers for both me and my sister years ago (I’m 19, she’s 22). She did it out of necessity at first because we both broke out in a rash when she put conventional diapers on us but she loved how much money she saved. She also loved putting them out in the sun to dry after she washed them to bleach them and give them a fresh scent. Obviously I’m not looking at kids very soon but I Iove hearing your thoughts on all things baby because I don’t have many older females around me to learn this stuff from. And I love how honest you’ve been. Congratulations, by the way! That’s really awesome you’re going to try out cloth diapers. And so nice there’s a club to teach you everything you need to know – I’m sure that’s the best way to learn. We cloth diaper our 22 month old and will cloth diaper #2 when he or she arrives right about the time BERF arrives. We use exclusively pocket diapers (BumGenius, Alva Baby, Rumparooz, and Fuzzibunz). Originally, I liked the velcro diapers, but as they aged, the velcro didn’t want to velcro anymore. I am now in love with the snap diapers. Cora’s figured out how to undo velcro, but snaps still baffle her. We’ve rarely had a problem with leaking. It’s usually because she’s grown and we haven’t adjusted the fit correctly yet. Cora wears a double stuffed BumGenius 3.0 with a Thirsties hemp as the doubler overnight for nearly 12 hours and wakes up dry. We have a top loading washer and we wash every other day. I use Rockin Green cloth diaper detergent and we use the Soft Rock version because we have very soft water. We installed a diaper sprayer on the toilet and that took care of rinsing out the poo before putting it in the diaper pail. Honestly, the diaper pail doesn’t smell as bad as a trash can with disposable diapers. The poo goes in the toilet instead of festering in a trash can. 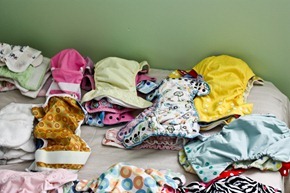 If you check with your local cloth diaper store, they may offer a cloth diapering class. Ours here in Columbus, Ohio – Sprout Soup offers one. While there, I’d also check into baby carriers. I don’t recommend the Baby Bjorn. While popular, I don’t like the way the baby is held in the carrier – dangling by his/her crotch – not good for kiddo’s back. I’ve seen so many babies in these being worn incorrectly as well- baby not nestled close to mom, sitting way too low on mom’s body. I love our Beco Butterfly II, which creates a seat for the baby from knee to knee. My 22 month old still fit comfortably in the Beco last week on vacation on my back. I want to cloth diaper too. So glad you have a cloth diaper club local. I probably won`t be so lucky. Let us know which you prefer. It may be after baby is born. That is an *amazing* gift! Even at used prices, 45 diapers are worth a lot of money, and it’s awesome that you have such a big variety to try out. Different things will work better or worse depending on the shape of your baby, and in some cases different things will work better at different times as he/she grows. We’ve been cloth diapering my 10 month old since she was a couple weeks old, first with Bummis prefolds and covers, and now with a combination of prefolds/covers and pockets. Pockets are a bit easier for quick changes now that she’s mobile, but they’re more expensive. Well a little boy just might like zebra! My little guys (20months) now knows his colours/patterns and sometimes is very specific about wanting his cow diaper or monkey diaper! God forbid if we have to put a plain coloured diaper on! There is a ton of info out there, I’m sure you’ll figure it all out. It seems complicated but it really doesn’t have to be. How awesome to have resources locally. It’s surprisingly quite addictive, I’m insanely jealous of the awesome stash that dropped in your lap. Of the ones you mentioned I really like thirsties. I’m not crazy about the way bumgenius fits my little guy but lots of people love them. Blueberry seems pretty highly regarded, looking forward to trying one of their covers soon myself. I’ve been known to put girlish diapers on my boy, hopefully by the time he cares he’ll be out of diapers. Wow, that’s amazingly generous of Stephanie! I cloth diapered my 1st daughter almost exclusively and my second daughter off and on. I have almost all Bum Genius one size and Goodmamas (they’re what worked best for us). My best advice would be to get a diaper sprayer! They cost about $10, I believe, and they hook into the back of your toilet so you can easily spray out poopy diapers then drop them in a wetbag (also a necessity if you don’t have one of those yet). You don’t need a diaper sprayer until the baby is eating solid food though, because as others have said a breastfed baby’s diapers can just be tossed straight into the wash.
And I don’t know what sizes of diapers you have, but if you plan on starting from the very beginning you’ll need some teeny ones…I thought my one-size adjustable diapers would do the trick but even on the smallest size they didn’t start fitting my girls all that well until they were about 3 months old. You’ll get SO many disposable diapers at the hospital though (and probably some at showers too) that you might just want to go through those in the first couple days after the baby is born so you’re not having to do extra laundry on top of getting to know your baby and sneaking in rest where you can! Cloth diapering is fun though! I think you’ll like it! Cville seems to have so many resources at your fingertips for general life topics such as this. I am sure my home area (Houston) does too just takes some more searching/research to find I suppose. What a nice gift and blessing to get all of those cloth diapers! How nice of Stephanie to donate all of those cloth diapers! You have an array to choose from. It is nice to have such a big supply! YAY! So happy to hear you are trying cloth. I wanted to ask but was afraid I’d come across as pushy! I have a whole site dedicated to cloth diaper advice. Feel free to contact me if you have any questions. You’ve helped me so much, id love to help you back! 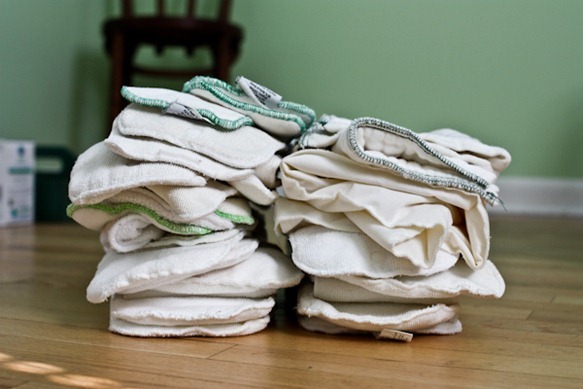 We use cloth diapers at our house-pockets and microfibre or bamboo liners. They work really well, easy to wash and hang to dry. We use Norwex laundry soap, but many friends use Rockin Green and really like it. When my son was exclusively breastfed he only pooped 1-2 times a week after the first 6 weeks, so that was not a bid deal to handle. The flushable liners come in handy now he is on solid foods. Just thought I’d throw in my two cents. I think your decision to try cloth diapers is amazing! My sister just had a darling baby girl three weeks ago and plans to use cloth diapers as well; however, even the smallest size she bought swallows poor Aurelia completely (and she was born at a normal 7 lbs 8 oz). I am with you, Chelsea! The cloth are too big for newborns, and especially before the cord falls off you don’t want huge diaper covers rubbing against their bellies. Wow, you are ssssoooo lucky to get that stash! How awesome! We did part time cloth w/ my son. I stuck primarily to pocket diapers (the ones w/ a fleece layer inside where you can stuff in something absorbent (usually microfiber or hemp)– the bum genius is a good example. They were easy and even my husband had no issues with them (I usually stuffed them & had them ready to go & threw them into the wet bag when they were dirty). Breastfed poo is water soluble so you don’t have to do anything special until they are on solids or formula (then there are some soft disposable liners to catch the poo & you throw that in the trash). I liked the bum genius, but, as the reviews will say, the velcro washed poorly after several months, and you had to wash the cover w/ each & every pee. This time around I found that I want to have a separate cover, but I am not a fan of having to use a snappy or pins to keep a regular prefold. I found a local brand here called the Best Bottoms (google it & Nicki’s diapers) where there is an insert that snaps into a shell (the insert is a microfiber w/ a layer of fleece on the top). That way you can reuse the cover several times before having to wash it. Since the cover is the very pricey part, I figured this would be cheaper. I learned a TON by surfing around Jillian’s Drawers, they have some great tutorials! Good luck! I found the cloth to be so much easier than I ever imagined they would be (even if people looked at me like I was a bit nuts at first). They are completely different than our parents generation. The fact that my husband was ok w/ doing it part time (until the grossness of toddler poop came along) was a HUGE deal! 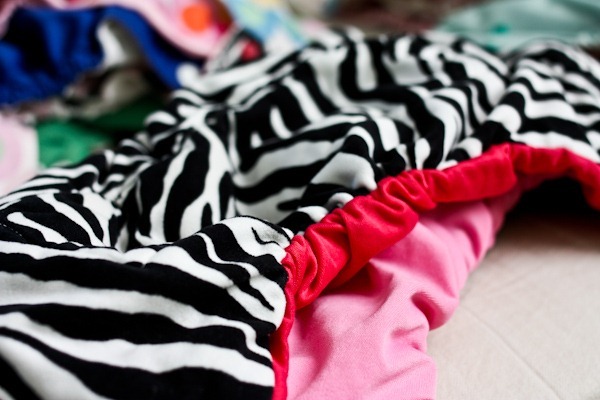 Oh yeah, and here is a great blog for cloth diapering. Tons of reviews on different brands. We use cloth diapers for Lucy too and have a couple different covers. My favorites are GroVia – the velcro version. But honestly, I’d say if you received covers for free, just use those! All the covers are similar enough, and its more about how you wrap the diapers, and making sure that you use the right size of cloth to prevent most leaks. We used cloth diapers for our daughter for her first 6 months at which time I switched to disposables (going back to work and her daycare would only accept a child in the latter). We used Bummies covers along with the traditional cloth insert. However, we did use a diaper cleaning service that came once/week to pick up the dirty ones and drop up a fresh, clean supply. I wouldn’t/couldn’t have done it without use of the service. Not so much as the poop would gross me out but it was just one less thing I would have to worry about washing. As it was, the covers would have to get washed frequently enough. And I think you have a great start with all those covers. 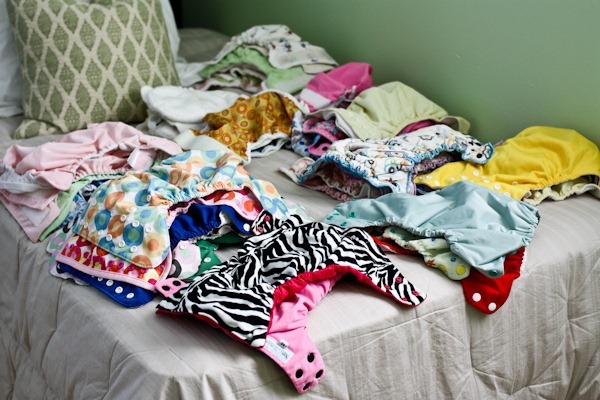 Its expensive to start out on cloth diapering and you already have what you need. I wouldn’t go purchasing any more until you see what works for you and the wee one. We are planning to use cloth diapers too, and I am totally jealous of your new stash of super-cute diapers. I’m looking forward to hearing how you like cloth diapering. I bet you will have a boy after saying that 😛 That was a very generous package! We are in the process of accumulating cloth diapers but are going to have some Seventh Gen disposables on hand for the first few weeks and for travel. One of our friends really loves Apple Cheeks a Canadian company and others love Bummis and BumGenius so we have decided to get a variety. We’ve saved so much money that they’ve more than paid for themselves. To be fair, they took some learning, we have to do laundry frequently, and, just as with disposables, they aren’t perfect. Also, I highly recommend some sort of flushable liner. You may still want a way to rinse them into the toilet, but flushable liners make the whole process with solid waste much easier. I’ve done very minimal research and had good intentions of going with cloth diapers for our first baby. But then I started to get all the NEGATIVE comments from people (MIL, hubby’s supervisor, etc). And I’m thinking, just because you guys had bad experience, doesn’t mean we will!! Grr! Kath, I am LOVING reading BERF. 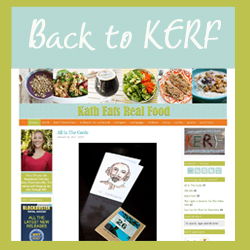 I have read KERF since your first post EVER back in 2007 (or 2008?) and back then I was still a crazy college gal. Now that I am married and hoping to have babes within the next 2 years these posts are SO fun to read and so informative. I just have to comment that you are resilent to deal with some of the rude (always anonymous) comments you get. I dont get why people continue to read if they are complaining.